Awhile back, I was contacted about reviewing a new product for families that love Shabbat but might struggle with Shabbat activities and snacks for their children. 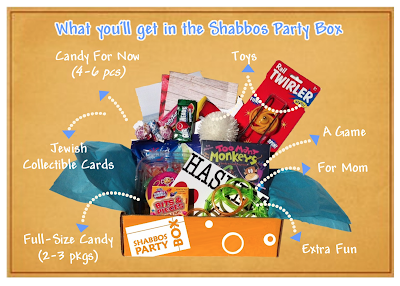 This product is a "box of the month" called the Shabbos Party Box! And, before I even start my review, let me just say that they're giving away some boxes, so pop over to their website and enter to win one! Now to the review. I really like the concept of the box, but I don't know that it's something that I'll buy into long term because I wasn't super jazzed with the contents. It definitely has plenty of nosh and activities for the price, but the sugar-coated goodies aren't really something that we go for in our family. We don't do the "Shabbat cereal" or "you can have brownies for breakfast because it's Shabbat" philosophy, so maybe this box isn't for us. Where was the gift for mom!? Okay, now that I think back on this, Little T does love chewing on the Lipstick, and Asher actually uses Rally Up as "peanut butter and jelly" (don't ask) for his babies. I felt bad that I just chucked the three containers of candy, however. Why not something healthy? Or even moderately healthy? Like a bag of veggie chips, natural gummies, or something that doesn't have a million ingredients? That's all I'm saying here. Overall, this just isn't for us. I like the idea, and I know it'll work for many people, but I don't think it'll ever be on our Shabbat "to do" list. Have you seen this box? Do you think you'd buy it for your family? It's been awhile since I responded to some of the Ask Chaviva Anything questions, so I thought I'd go through and answer a bunch in one quick (hopefully) post. This round of questions is devoted to marriage and family life, in honor of celebration FOUR YEARS of marriage to Mr. T on February 20th. Did you go through the shidduch process with Mr. T? 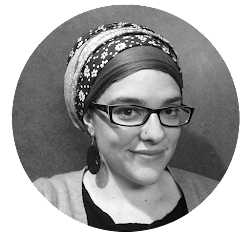 For those of you not in the know, the shidduch process is a matchmaking process, wherein you rely on a third party to find a suitable, meaningful marriage match. The answer to this is yes! I actually used a website called Saw You at Sinai, wherein there are matchmakers around the world who look through your profile and answers to questions to find you a match. Then they pair you up with people and both sides get the opportunity to deny/accept the potential opportunity to talk or meet. I'd been on SYAS for months, and I can't even begin to tell you how many men declined the opportunity to even talk to me. As a divorced convert, I wasn't such an attractive match, it seems. I tried to be really open and not picky, so I accepted several potential matches, but the first one that stuck was Mr. T. His profile said he was divorced with a kid and was a smoker, but something about his photos and profile sang to me. Shortly after we met, he quit smoking cold turkey (I have asthma, so this was a deal breaker), and the rest is history. What / when will you tell your children about your first marriage? Honestly, I don't know that I'll tell them anything about it. However, if it comes up, or they ask, or they're getting toward the age of marrying, I'll tell them about it, because I believe it provides a valuable lesson about expectations and when to follow your heart and when to follow your gut. My first marriage and that entire relationship is an example of so many things, primary among them happiness, what that looks like, and what you're willing to do in pursuit of it. When are you returning home, permanently? Home is where the heart is. My heart is currently in Denver. If you're asking when we're going to return to Israel, the answer to that is when we have enough money and stability to get by for 2-3 years without worry. It is taking longer than we anticipated for that to happen. I refuse to put my children in the position of "living in the red" and struggling from paycheck to paycheck. It might be the Israeli way, but it's not the way I want to live my life. You seem to be having a rough time of it lately, between 2 kids & your job. Do you feel things would have been easier had you stayed in Israel? Or, despite the difficulties, is it still easier in the US? No. Life would have been rougher had we stayed in Israel. Period. Also, since this questions was asked, I quit my job, and I'm finding that ONE THING that will make me happy, so I'm moving in the direction of finding my happy/stable/productive place. Do you ever find yourself upset still at how hard it was for your husband to reimmigrate to the USA? Absolutely, yes. 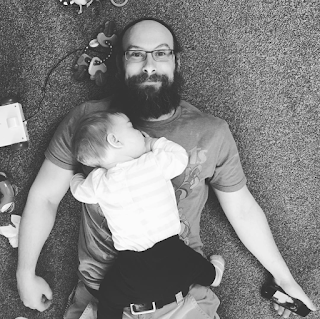 Especially as Little T gets closer and closer to the age Asher was when Mr. T left, I start to see milestones that he missed, and it breaks my heart that he missed those opportunities with Asher, but it also makes me so happy that he gets to experience those with our daughter. Have a question to ask? Pop over and ask with perfect anonymity! Those of you who have been following this blog for the past 11 years of its existence know that I've gone through a bajillion life changes, and they often happen in quick spurts of anxiety and chaos all at once. Well, welcome to another installment of "What did Chaviva do now?" I keep wavering between "This is going to be awesome" and "This is going to make me vomit." It's an epic place to be. I'm happy to say that every job I've ever left, with the exception of two, I've left on my own free will and at my own time. The two jobs that this didn't happen with were soft "letting go" situations and both happened after I moved to Israel and the two Denver companies I was working for decided they needed people closer to home to make things work (thanks Marissa Meyer). Every other job I've ever had I left. I quit. I walked away Most of the time, I leave a job because I grow impatient or bored. This time? I left a job because I was stressed, depressed, and felt terribly devalued. No job is worth those feelings. So what now? Well, I've got three part-time gigs I'm juggling, and thanks to a close friend who lit a fire under me, I'm going to start developing my own company. And this time, for one in my life, I'm going to start charging what I'm worth. I have this problem where I just want to make brands amazing, so I'll take whatever they pay me to get the chance to make them awesome. No more, folks. I'm a pro, I've been doing this for a very long time, and I'm really, really good at what I do. If I continue to devalue myself, my clients will, too. If I say it's $100 or $150/hour, you better bet I'm going to work my tuches off during that hour and you're going to shine because of it. Onward. Upward. It's time for me to take the reins of my destiny instead of someone else's. I'm ready to get back to where I was all those years ago where Chaviva was the brand, where my expertise was sought after, where I was the pro on panels. That's the person I am. 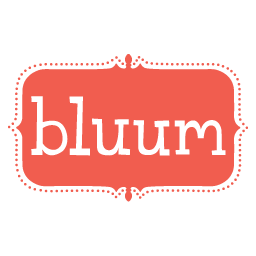 Stay tuned for a website geared toward my marketing prowess, a new logo and name, and more. Exciting times ahead, folks!